As part of the GUM 12 Mission project we ring the bell to raise money for the Salvation Army Red Kettle event during Christmas. ​The Salvation Army’s Giving Tree program provides new clothing or toys for children of needy families through the support of donors. Found in local companies and corporations, Giving Trees are decorated with numbered paper angel tags with the first name, age and gender of a child in need of presents. 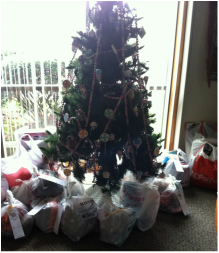 Contributors remove one or more tags from the tree and purchase appropriate gifts for the child or children described on the tags. 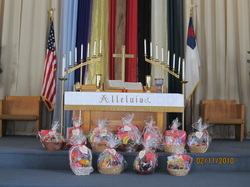 After Christmas, we prepare and deliver Sunshine Baskets to people who are not able to get out during the winter months. During the month of August, we receive donated filled backpacks and monetary donations to purchase backpacks and school supplies. 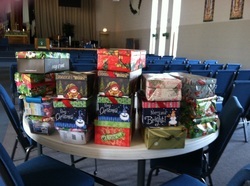 They are then donated to area schools and given to kids who are in need.